Rattlers RB Jabre Lolley makes his first of six trips to the end zone against the River Kings. PHOENIX, AZ - Jabre Lolley combined for six touchdowns as the Arizona Rattlers stepped on the gas early and often in a week 2 win over the Cedar Rapids River Kings tonight at Talking Stick Resort Arena, 81-37. 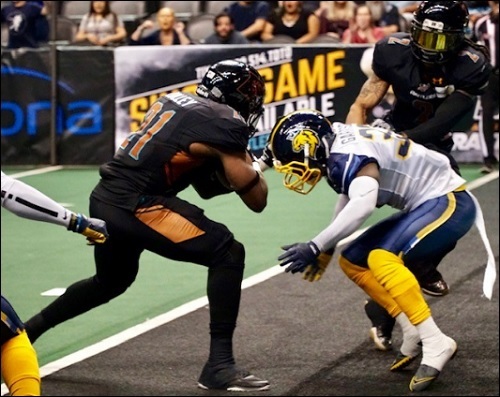 It was the home opener for the Rattlers and the win moved them to 2-0 on the Indoor Football League season. The River Kings fell to 0-2 with the loss. Arizona wasted no time getting on the board. After taking advantage of an exceptional kickoff return, they scored just a minute into the game on a five-yard run from Jabre Lolley. It was Lolley's fourth rushing touchdown of the season. After Henry Nell converted on a 50-yard field goal, Dezmon Epps returned the ensuing kickoff 54 yards to give the Rattlers a 14-3 lead with 10:57 left. Reed found Epps for a 34-yard touchdown bomb. The River Kings got into the end zone with just over a minute left in the opening quarter when quarterback Kurt Palandech scrambled in from a yard out. Reed brought the Rattlers right back, scoring on a 44-yard designed run around the left side. Cedar Rapids slowed the bleeding with a 10-yard pass from Palandech to Kahri Kimbrough and the River Kings were within 10 at 27-17 with 12:08 to go. Jamal Miles scored on a four-yard run, then Lolley punched it in from six yards out and the rout was on. Palandech made the score 39-24 with his 25-yard scramble right up the middle. Reed hit veteran Anthony Amos for a 18-yard score and the Rattlers led 46-24 with 2:53 left in the second quarter. Nell's 19-yard field goal pulled the River Kings to within 19 with 21 second to go in the half. That proved to be adequate time for Arizona as Reed found Jabre Lolley on a short pattern. Lolley ran down the left sideline and scored with just seven seconds left. The Rattlers held a 53-27 lead at intermission. The scoring slowed considerably in the third quarter. Jeff Ziemba entered the game for Verlon Reed and tossed a 41-yard score to Amos on just his second play from scrimmage. Nell hit his third field goal of the game, this one of 35 yards, to make the score 60-30 with 5:30 left in the quarter. Arizona came right back as Ziemba found Lolley on a short pass. Lolley sprinted down the right side 34 yards for the score. The Rattlers led 67-30 after three. Lolley's 15-yard run on the first play of the fourth quarter extended the Rattlers' lead to 74-30. Cedar Rapids scored their first touchdown in nearly a quarter of play on Palandech's six-yard pass to Marquel Wade. Lolley scored his sixth touchdown of the game, a five-yard rush, to put the Rattlers up 81-37 at the six-minute mark of the game. Arizona out-gained Cedar Rapids in total yards, 359 to 249. They had a 195 yards to 114 advantage in the passing game and a 164 yards to 135 in the running game. The River Kings were penalized twice for 10 yards, while the Rattlers were flagged eight times for 34 yards. Cedar Rapids led in time of possession, 39:59 to 20:01. The Rattlers utilized their two-headed monster at quarterback, with Verlon Reed starting and Jeff Ziemba coming in during the second half. Reed threw for 120 yard and three touchdowns, and ran for another score. Ziemba had touchdowns on both of his pass completions, throwing for 75 yards. Lolley was outstanding, rushing 10 times for 87 yards and four touchdowns, while catching a pair of passes for 70 yards and two scores. Amos hauled in three balls for 64 yards. Joshua Gordon recorded a pair of sacks before leaving the game in the first half to injury Nikolaus D'Avanzo had a sack, while Davontae Merriweather had 7.5 total tackles and an interception. Palandech finished 15 of 27 for 114 yards with two touchdowns and an interception. He also rushed seven times fo 42 yards and another score. Nathaniel Chavious was a bright spot for the River Kings. The rookie running back gained 89 yards on 16 carries and a touchdown, while cautching six passes for 36 yards and a touchdown. Marquel Wade had five receptions for 41 yards and a score. Malik Slater led Cedar Rapids with five total tackles, and Jordan smith forced and recovered a fumble. The River Kings are back at home in week 3 as they will host the expansion San Diego Strike Force on March 9 with kickoff set for 5:05 p.m. The Rattlers have a bye next week before returning to action at home against the Tucson Sugar Skulls. Kickoff in that one is scheduled for 5:05 p.m. All times are pacific standard time.